Scars. We all have them. Some of my scars are visible; the scar on my knee from the time when I fell off my bike in grade seven. A little scar on my nose when my brother and I were playing under a table and the leaf of the table collapsed on top of me. 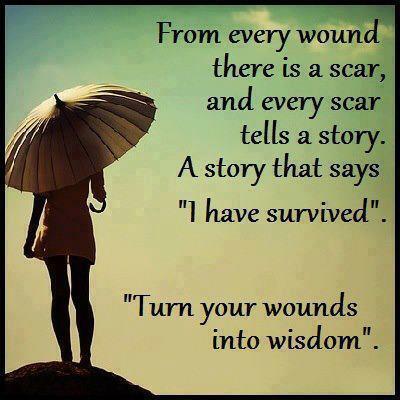 I have “battle” scars from my journey with cancer in 2001. Scars. We all have them. The thing about scars is that they are often associated with “pain“. I can remember with great clarity how I felt when my body was marked with each one of those scars. I remember the pain vividly. It wasn’t pleasant, but I have learned that scars are marks of ownership to the Father. As we experience the pain, we experience the Father as He helps us get through the pain. I have learned by walking with the Father that sometimes pain, when processed with the Father, has the great potential to be used for His perfect purpose. There are also scars that no one sees. Years ago I heard my former Pastor call them “Heart Scars”, and he said they are oftentimes far more hurtful and damaging than those outward physical scars we bear and their effects last far longer, sometimes for a life time. Heart Scars are caused by a friend’s betrayal, a careless word or comment that stings and hurts; gossip, lies, judgmental attitudes, broken relationships. Those scars run deep and unless processed through with the Father, they never heal,… not completely. I had not thought of it like that before. Certainly when I went through breast cancer years ago, I did not know that I would come to a point in my life where I could honestly say I was thankful for my cancer. You see, God changed me through the experience and He did so by using my scars and my pain to draw closer to Him. 1. God used pain to move me. I couldn’t ignore the fact I had cancer. I had to take action, it would have cost me my life otherwise. I had never thought much about my health or my mortality before. A cancer diagnosis forced me to rethink priorities in my life. 2. God used pain to move me towards Jesus. I ran straight into the arms of Jesus. I had no one else to turn to. Although I had the support of family and friends there were times they just couldn’t comfort me, try as hard as they might. In my pain, God revealed Himself to me more clearly and compassionately than ever before. I would never have experienced Him the way I did without journeying with Him through cancer. 3. God used pain to move me towards others. We are called to bear one another’s burdens, encourage, befriend, support, and love one another. I allowed others to minister to me during my time of need. I relied on them as I never had before. I let go of foolish pride to allow myself to become vulnerable not only before others but before God. 4. God used pain to bring me together with others who have experienced similar suffering. I have been blessed to be able to fellowship with many courageous women who, like me, have experienced breast cancer and some who are still experiencing breast cancer. We are part of sisterhood and we have a special bond and camaraderie together as a result. I can empathize with them, cry with them, laugh with them, but mostly I can point them to the One Who will ultimately brush every tear away and heal them of their pain…Jesus Christ. One of the most profound things I learned was that pain is not to be wasted! Whoa! Think about that. Whatever circumstance right now that you are in, big or small…if you are experiencing pain, do not waste it! If God has purposed you to experience cancer (or any other kind of “pain” physically, or if you are experiencing Heart Scars) do not waste the opportunity to draw nearer to God and to others through the experience. 1. You will waste your cancer if you do not believe it is designed for you by God. It will not do to say that God only uses our cancer but does not design it. What God permits, he permits for a reason. If you don’t believe your cancer is designed for you by God, you will waste it. 4. You will waste your cancer if you refuse to think about death. “Teach us to number our days that we may get a heart of wisdom.” (Psalm 90: 12) Numbering your days means thinking about how few there are and that they will end. How will you get a heart of wisdom if you refuse to think about this? 5. You will waste your cancer if you think that “beating” cancer means staying alive rather than cherishing Christ. Satan’s and God’s designs in your cancer are not the same. Satan designs to destroy your love for Christ. God designs to deepen your love for Christ. Cancer does not win if you die. It wins if you fail to cherish Christ. God’s design is to wean you off the breast of the world and feast you on the sufficiency of Christ. 6. You will waste your cancer if you spend too much time reading about cancer and not enough time reading about God. It is not wrong to know about cancer. Ignorance is not a virtue. But the lure to know more and more and the lack of zeal to know God more and more is symptomatic of unbelief. Cancer is meant to waken us to the reality of God. It is meant to put feeling and force behind the command, “Let us know; let us press on to know the Lord.” (Hosea 6:3)… What a waste of cancer if we read day and night about cancer and not about God. 7. You will waste your cancer if you let it drive you into solitude instead of deepen your relationships with manifest affection. When Epaphroditus brought the gifts to Paul sent by the Philippian church he became ill and almost died. Paul tells the Philippians, “He has been longing for you all and has been distressed because you heard that he was ill” (Philippians 2:26-27) What an amazing response! It does not say they were distressed that he was ill, but that he was distressed because they heard he was ill. That is the kind of heart God is aiming to create with cancer: a deeply affectionate, caring heart for people. Don’t waste your cancer by retreating into yourself. 8. You will waste your cancer if you grieve as those who have no hope. There is a grief at death. Even for the believer who dies, there is temporary loss—loss of body, and loss of loved ones here, and loss of earthly ministry. But the grief is different—it is permeated with hope. “We would rather be away from the body and at home with the Lord.” (2 Corinthians 5:8) Don’t waste your cancer grieving as those who don’t have this hope. 10. You will waste your cancer if you fail to use it as a means of witness to the truth and glory of Christ. Christians are never anywhere by divine accident. There are reasons for why we wind up where we do. Consider what Jesus said about painful, unplanned circumstances: “They will lay their hands on you and persecute you, delivering you up to the synagogues and prisons, and you will be brought before kings and governors for my name’s sake. This will be your opportunity to bear witness.” (Luke 21:12-13) So it is with cancer. This will be an opportunity to bear witness. Christ is infinitely worthy. Here is a golden opportunity to show that he is worth more than life. Don’t waste it. This entry was posted in Inspiration & Devotion, Proverbs 16:9 - Journey Thoughts and tagged Breast Cancer, Cancer, Challenges, Christianity, Desiring God, John Piper, Life, Pain, Romans 8:18-21, Suffering. Bookmark the permalink.